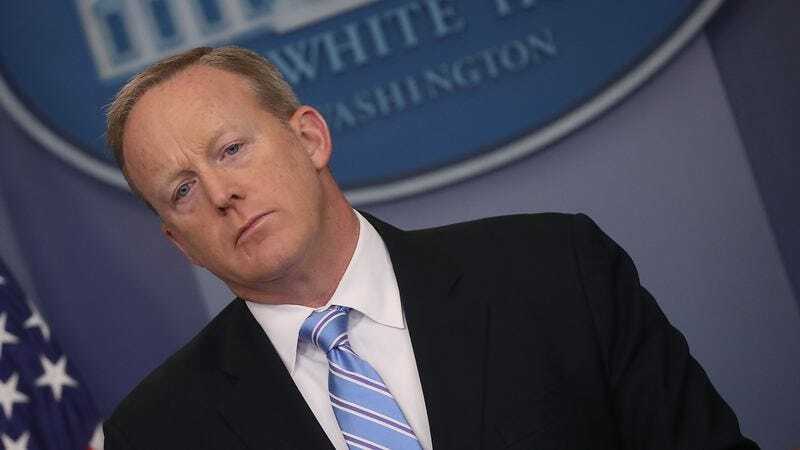 Sean Spicer had a post-resignation Sean-off tonight, appearing on Fox News’ Hannity to clear the air over his departure from his job, one of the quickest in White House press secretary history. And while much of his chat with his fellow Sean, Hannity, was spent assuring the American public that he was the one who asked Donald Trump to let him go from his position (citing a desire to give new press secretary Sarah Huckabee Sanders and communications director Anthony Scaramucci a fresh, Dippin’ Dots and Holocaust-free slate), he did address his six-month tenure as America’s accidental Easter Bunny clown. Specifically, Spicer talked about Saturday Night Live, where writers delighted in finding ever more absurd ways for guest star Melissa McCarthy to lampoon him. Although Spicer admitted to “cracking up” at some of the portrayals of him—hence his occasional attempts to portray his relationship with the media in what a casual observer of human behavior might call a “vaguely playful” manner—ultimately, he called out much of it as “mean.” “I think that there were parts of it that were funny,” Spicer told Hannity, “But there’s a lot of it that was over the line. It wasn’t funny. It was stupid, or silly, or malicious.” We can just imagine Spicer watching the show the next morning—because, as he’s said, he never stays up late enough to watch it live—and reaching for another pack of cinnamon gum to joylessly eat and ease his wounded spirit.